I experimented with a spray colour new to me, Montana’s Duck Season (G8040), thinking it would be a good shadow colour for white Austrian and Hungarian uniforms. What I thought would be a khaki colour turned out to be much yellowier than I expected. I went ahead and (rather laboriously) painted the first unit of my Austrian army, a Hungarian unit, all the while thinking that it was an experiment I would never repeat – at the same time grudgingly acknowledging that Duck Season was a great primer for the yellow facings! The first unit of the Austrian Army I painted was a three-stand, 18-figure battalion of Infantry Regiment Nr. 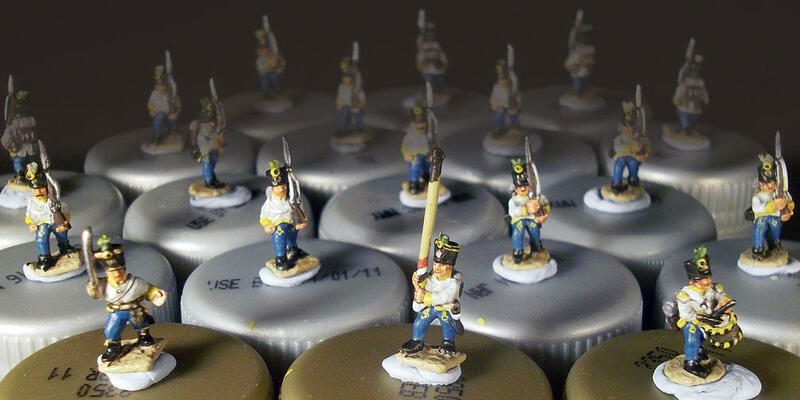 2 Freiherr von Hiller, a Hungarian regiment with the distinctive blue breeches of the Hungarian regiments – and the 1806 shako that in 1809 had, it is generally agreed (at least by manufactures of wargames figures! ), been adopted by most of the Hungarian line infantry regiments but not yet by the German regiments. The 2nd Regiment was distinguished by emperor yellow facings. Its Colonel-in-Chief was Hiller who commanded VI Corps at the Battle of Aspern-Essling. First battalion of IR2 ready to be varnished. The standard is incomplete and needs finishing off with a bit of green stuff.